Book hotel rooms online with us at Hotel Quinta do Lago at the lowest rate, guaranteed. 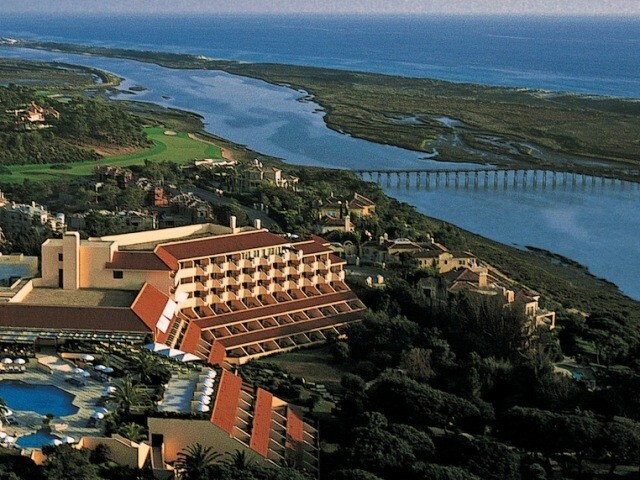 Get a holiday discount room rate at the 5 Star Hotel do Lago located in the Quinta do Lago Resort in the Algarve. The luxury hotel is surrounded by nine golf courses, faces the sea with a short walk to an extensive sandy beach .The hotel has 141 generous air-conditioned bedrooms providing holiday accommodation for two persons. Each room is equipped with cable TV, internet connection, direct dial phones, safe and mini-bar. Hotel do Lago in the Algarve is set in generous landscaped gardens include the following facilities: Health Spa with massage and treatments, a Fitness Centre, sauna and steam baths, indoor and outdoor pool, gourmet Italian cuisine restaurant, tennis, horse riding, kids, playground and Kids Club, beauty parlour, Bridal Suite, Business Centre, Wi-Fi, shops, and a Beach Concession operating during the season with various sea sports.